Carmel Meadows is located west of Hwy 1, stretching out to the Pacific. It is located south of the Carmel Point neighborhood, and has gorgeous beaches and magnificent homes on the hilltop above. As you enter Carmel Meadows from the north around Scenic Road, you will reach Carmel River Lagoon. A wetlands preserve, you will encounter varieties of amazing waterfowl here including great blue herons, geese, pelican and more. It is a treat for the amateur or experienced bird watcher. Continuing your coastline trek south through Carmel Meadows you will reach Carmel River State Beach. Where the Carmel River enters the sea, it is a pristine crescent shaped beach that is popular with locals and less congested than Carmel Beach can be on a sunny Saturday. At the southernmost portion of Carmel River State Beach you will find a beach known as Monastery Beach, named for the white tower of the Carmelite Monastery across the highway. Formerly known as San Jose Creek Beach, it is popular with scuba divers but not for swimming as the surf can be extremely dangerous. 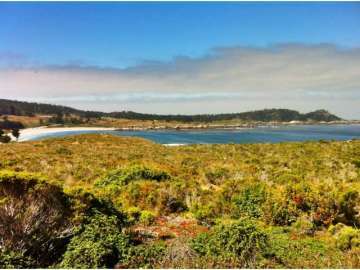 At the southern tip of the neighborhood you will find a meadow which sits above the beach offering expansive and elevated views from Point Lobos to Pebble Beach. Click here to preview all Carmel homes for sale in the Carmel Meadows neighborhood. For all available Carmel real estate, click here. Homes in Carmel Meadows possess stunning views of Point Lobos, many featuring floor to ceiling windows to showcase the spectacular postcard vistas. 6 homes sold in this neighborhood in 2018. The most expensive home was a 3 bedroom, 3 bathroom home with 2,491 SqFt of living space, just steps to the Ocean and Ribera Beach on a 6,400 SqFt lot and sold for 3.7 million. The least expensive home was a 3 bedroom, 3 bathroom home that overlooks Fish Ranch and the Carmel river with 2,604 SqFt of living space on a 7,920 SqFt lot. In 2017 6 homes sold in this neighborhood. The most expensive home that sold was a mid-century modern home with panoramic Ocean views and featured 4 bedrooms, 3.5 bathrooms, 3,868 SqFt of living space on a 10,000+ SqFt lot and sold for 5.24 million. The least expensive home was a 3 bedroom, 3 bathroom, 1,766 SqFt home on a 20,038 SqFt lot and sold for 950K. 5 homes sold in this neighborhood in 2016. The most expensive home to sell was a 3 bedroom, 3 full and 2 half bath home with 3,776 SqFt of living space, water views, direct access to the beach on .3 acres and sold for 5 million. The least expensive home sold for 1,392,500 for a 2 bedrooms, 2 bathrooms with 1,519 SqFt of living space on .22 acres with Ocean views. 9 homes sold in this neighborhood in 2015. The most expensive home to sell was a Cape Cod style home featuring Ocean views, 5 bedrooms, 3.5 bathrooms, 3,932 SqFt of living space on a .3 acre lot and sold for 4.3 million. The least expensive home sold for 832K and features 4 bedrooms, 2.5 bathrooms, 2,353 SqFt of living space on .45 acres. 10 homes sold in Carmel Hills in 2014. The most expensive home sold for 5 million for a 5 bedroom, 4 bathroom, 3,138 SqFt home with 180 degree views of the bay. The least expensive home to sell was a 3 bedroom, 3 bathroom home with 2,845 SqFt of living space on .33 acres. In 2013 7 homes sold in this neighborhood. The most expensive home sold was a 3,518 SqFt home on a 7,200 SqFt lot, which sold for 4.5 million. The least expensive home sold in 2013 was a 1,635 SqFt home on a 8,900 SqFt lot, which sold for 928K. 8 homes sold in Carmel Hills in 2012. The most expensive home sold for 3.85 million and had 3,510 SqFt of living space on a 14,909 SqFt lot. This architecturally striking home had panoramic views and an unrivaled beachfront location. The least expensive home sold in the neighborhood came in at 700K and was a 2,579 SqFt 3 bedroom, 3 bath home on a 7,700 SqFt lot. It was built in the early 1950’s and needed upgrades and improvements to maximize its potential. To live in Carmel Meadows is to live in arguably one of the most beautiful places imaginable. After all, it was the northern shore of Point Lobos that inspired Robert Luis Stevenson to write Treasure Island. You will enjoy walking and hiking the trails that wind around the neighborhood and witnessing the ever changing tides and sunsets that create such a dramatic backdrop to your home. You maintain wonderful proximity to Carmel-by-the-Sea and Pebble Beach for golfing, shopping and dining. But with a home in this magnificent neighborhood you may never want to leave!